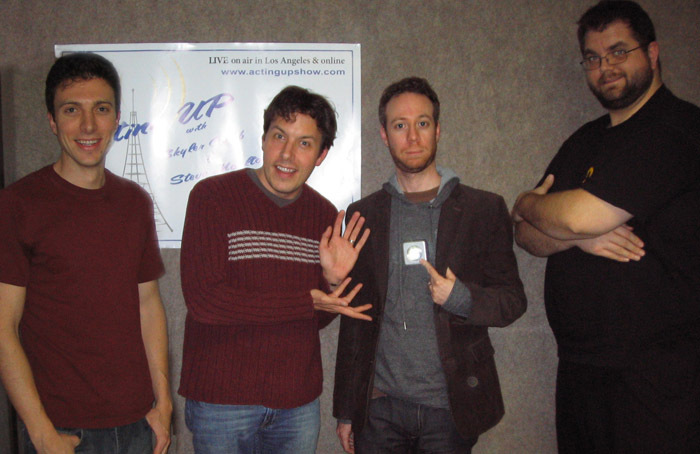 Download this episode with actors John Ross Bowie and Kevin Sussman! Skyler plays his comedy rap debut with huge-in-Denmark rapper Burnt Toast, who briefly comes into the studio as well. The song is "Ping Pong Playas (Kill What U Cherish)"
John Ross Bowie and Kevin Sussman talk about their roles on Big Bang Theory. Kevin talks about his role in Wet Hot American Summer. John and Kevin take listener questions. Topics hit are Kevin Hill, Road Trip, training with legendary coach Uta Hagen, silly day jobs, and more. John talks about his involvement in the Upright Citizens Brigade. John and Kevin are both put in the Pressure Cooker.